* The Atelier Cologne signature is to blend unique and unexpected notes with traditional cologne elements (fresh citrus) to create a modern take on colognes. * Ambre Nue starts off with a fresh and sweet tangerine mixed with bergamot. * As a Cologne Absolue, this scent is stronger than a traditional Eau du cologne and lasts much longer. * The citrus is joined by dry cinnamon and light white florals. * This fragrance wears differently on me. Sometimes I get a light scent of tarragon in the middle development. Othertimes, the amber starts to come in with the white florals. * Amber becomes the star in the base notes supported by a clean patchouli and vanilla. The base lasts for several hours. Summary: Ambre Nue starts off like a citrusy cologne and develops overtime into a richer, comforting amber scent. Although there is a good bit of sillage for the first hour or two, it is never overwhelming making this scent a great one for office wear. The citrus will wake you up when you first put it on in the morning and vanilla/amber base will give you comfort as you finish off a long work day. 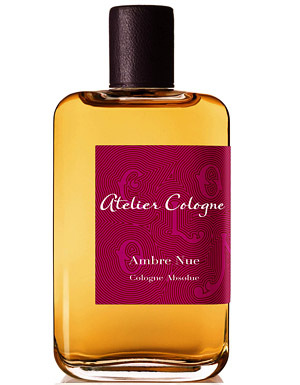 Ambre Nue is available from Lucky Scent, Neiman Marcus, and from the Atelier Cologne website. I can’t believe I’m saying that, but Ambre Nue is too sweet for me. I’m amazed since usually I do not smell sweetness where others do (or even complain about it). This one developed uncomfortably sweet both on me and on my vSO (he was kind enough to allow me testing on him something he hasn’t even smelled before I sprayed it on him in the store).